If you’re looking for a simpler way to customize your Genesis child theme, without having to hack your website to pieces? Well, there is a way. 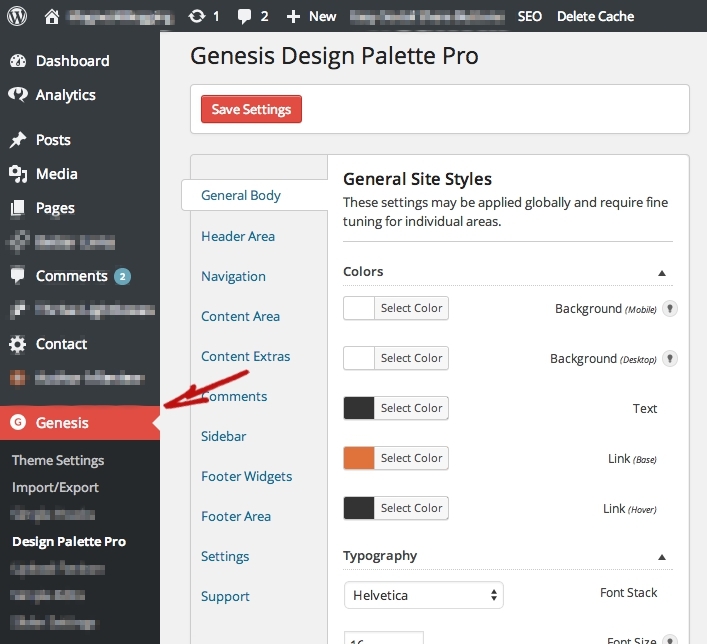 With Genesis Design Palette Pro, it’s now possible to tweak the design of your theme without breaking your site. 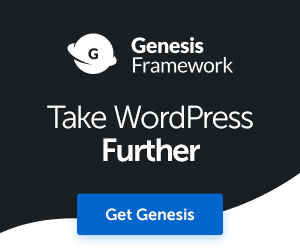 A short while back, I shared an in-depth review of the Genesis theme framework platform for WordPress, if you would like to check that review out, just click here. OK, so today I want to review an amazing little plugin that complements Genesis very nicely. It’s called Genesis Design Palette Pro, or GDPP for short. GDPP is a powerful WordPress plugin designed to make the process of customizing any Genesis child theme easier. The plugin was developed by Andrew Norcross and Josh Eaton of Reaktiv Studios. What problems does using this plugin help me to solve? Here’s the deal. Not everyone is a WordPress developer. 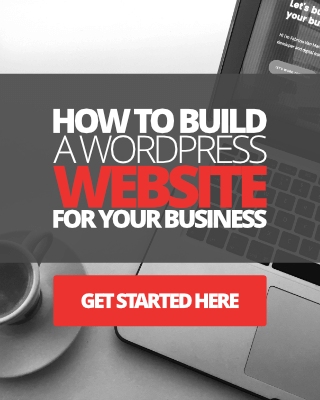 Most folks just want to be able to make their website look half-decent, maybe add a little bit of branding and customization, and then focus on building their online brand or business. So, you can imagine, before this plugin came to light, customizing any Genesis child theme would be a complete nightmare for most none techy folks. I started using this plugin many, many years ago now, way back before I was even competent enough to understand or even write a single line of code. When the Genesis Design Palette Pro Plugin came along, I was one happy chap. If you’re a novice Genesis user yourself and find modifying or customizing your child theme a complete nightmare, then you can probably relate to this. Just doing some basic things like changing the font style, font size, or even the theme background colors, would mean having to spend precious time messing around with your theme files. Thankfully though, this little plugin came along to make things easier for many Genesis users, including myself at the time. With the Genesis Design Palette Pro plugin, you can edit quite a number of elements in your Genesis child theme, again, all without having to touch a single line of code. So, if you’re wondering what kind of problems will this plugin solve for you, it’s very simple. It will save you time and also your sanity. Gone are the days of spending endless hours tweaking bits of code here and there in your CSS file just to make your theme more unique to your brand. Yes, it will work with most of the current StudioPress child themes available. No, you don’t need to have any skills or knowledge in HTML or CSS to use this plugin. Absolutely zero! No, this plugin will not break any other customizations that you’ve already applied to your Genesis child theme. 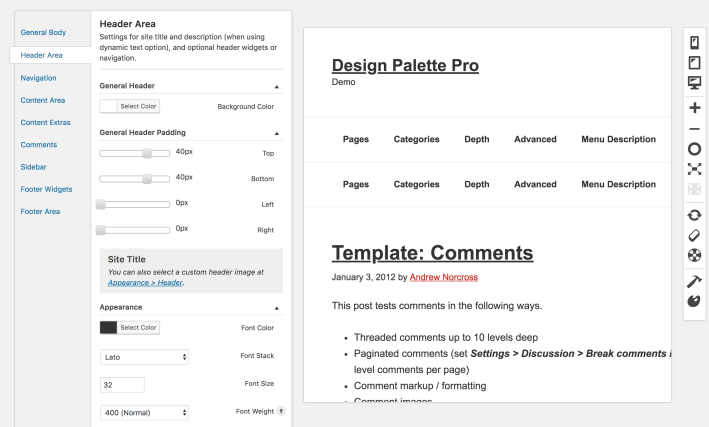 Genesis Design Palette pro creates a separate CSS file and makes the changes in that file only. Your original theme settings stay completely untouched. So, now that we’ve addressed some of the benefits of using the GDPP plugin, let’s look at installation and usability. Installing the Genesis Design Palette Pro plugin is very easy. It’s just like installing any other plugin on your WordPress website. Once installed and activated, to access the plugin settings you simply go to Genesis > Design Palette Pro. See the image below. You can see the available tabs in the main dashboard from the above screenshot. 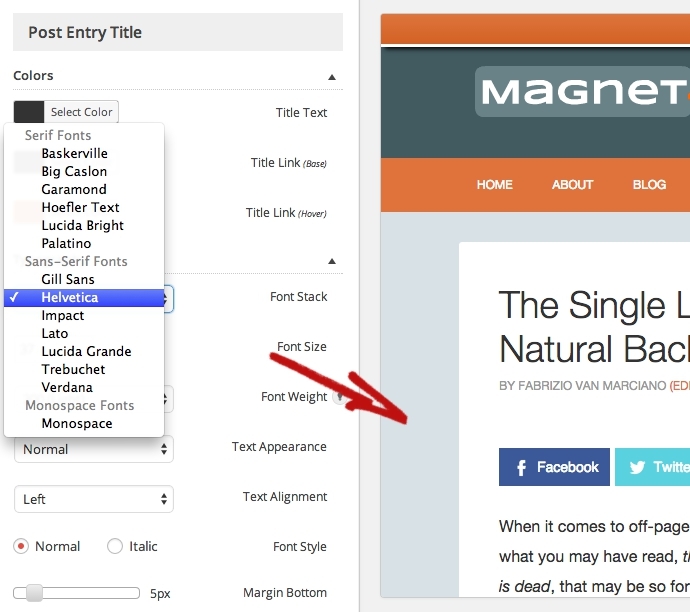 Here you have options to style and customize all of the major areas of your Genesis child theme. This option lets you make global changes to colors, fonts, and even upload a Favicon to use on your site. Have you ever tried adding a Favicon to your Genesis theme manually? If you don’t know how to do it, it can be a bit tricky. You can refine anything simply by clicking on each tab to access more options and settings for different areas of your site, as shown in the image above. If you’ve just installed the GDPP plugin, I recommend you play around with the options and get familiar with the settings, before making any major changes to your site. The screenshot above shows how you can refine some of the changes to the content area of your Genesis website. You’ll notice that there is a live preview window showing your website in the right column. This is useful because any changes you make in the design column will take effect in the right column immediately, in real-time. When you’re happy with the design changes you’ve made, you can go ahead and hit the save button, it’s so easy. 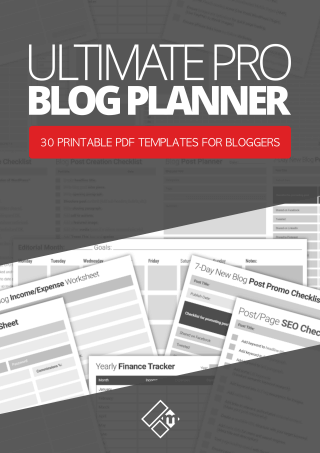 Think how much time you could save with your blog customization using this plugin. With the GDPP plugin, you can say goodbye to the endless hours spent searching and modifying bits of code in your theme files. 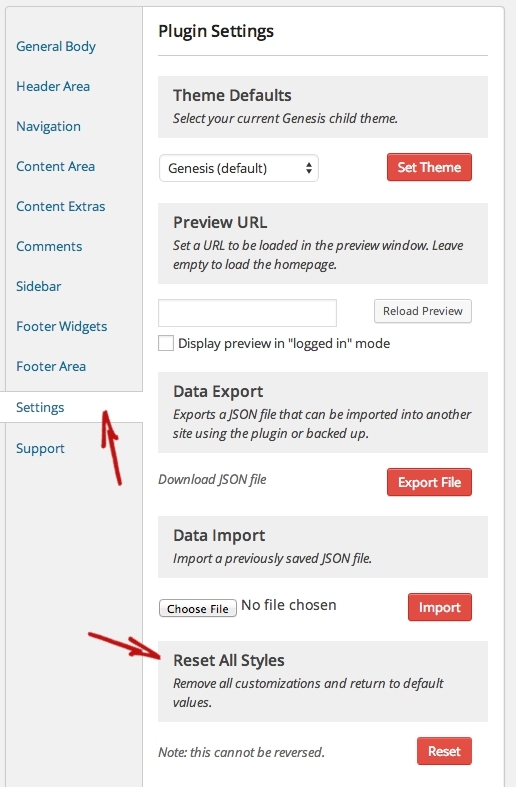 Under the Settings tab, you have options for setting the default child theme, preview URL, data export, and import. The import option is useful if you want to import settings used on another theme. Or, you can export the current settings to use on another site. And, let’s say if all your tweaks and mods go haywire, you can simply hit that reset button and remove all of the customizations you’ve made and start over. Although I like this feature a lot, it would have been fantastic if the settings tab had included an Undo/Redo feature. So what exactly can you customize or change using the Genesis Design Palette Pro plugin? Content extras (Such as ‘read more’ links, ‘bread crumbs’, ‘pagination’ and ‘author box’). Footer widgets and footer area. Typography (Font style, weight, color), text alignment, paddings, and margins. Other notable features in this plugin include the ability to preview on mobile layouts and child theme add-ons. In the latest version of the GDPP plugin, a Freeform CSS box has been added so that you can add your own CSS to your Genesis Child Theme. This is particularly useful if you have some knowledge of basic CSS. Great for adding even more customizations to your Genesis child theme. The preview window also allows you to view your site in mobile, tablet, and desktop during customization. So, how much does the Genesis Design Palette Pro plugin cost? So if you haven’t already guessed by now, this isn’t a free plugin. It’s a premium plugin. There are currently 3 plans available for Genesis Design Palette Pro. There is a Basic Plan which will set you up for 1-years worth of standard support, 1-years worth of upgrades, documentation, import and export capabilities, live preview, and child theme extensions. The single basic license will set you back $49. There is also a Plus Plan which will set you back $89 and give you a 5 site license. All of what’s included in the basic package, plus priority email support is included in this plan. Finally, there is a Deluxe Plan which will cost you $199 and give you a 50 site license, 3 exclusive palettes, and priority email support. Great for personalizing child themes without coding or hacking your theme to death. It won’t break your theme’s existing setup or customization. It’s a premium quality plugin with a great money-back guarantee. Useful mobile, tablet, and desktop preview. Quite expensive for a plugin of this kind. The Basic Plan would perhaps be more appealing at $39, I think. An alternative to the GDPP plugin would be the Genesis Extender Plugin by CobaltApps. That plugin costs around $99, however, you can do so much more. Would have loved to see an ‘undo’ and ‘redo’ feature added to the settings, however, you can reset everything. Perhaps a few more font style options built-in too. This is a great all-around plugin and a wonderful addition to have and use with any Genesis child theme. I do recommend it if you’re not confident enough, or even have the time, to learn and apply your own CSS customizations to your Genesis powered website. Or, if you don’t have a ton of cash at your disposal to pay for a professional developer. And, the GDPP plugin is a real time saver too which is the big selling point for this plugin. Price-wise, however, I do think it’s pretty steep for what you can actually do with this plugin, that’s my honest opinion. As an alternative, I would recommend checking out the Genesis Extender plugin. Although some knowledge of CSS is required to use that plugin, you can do so much more with it. All-in-all, the Design Palette Pro plugin is a great little tool. If you want to be able to add some simple customization to your Genesis child theme quickly, and you don’t want to mess around with code, then this is for you. 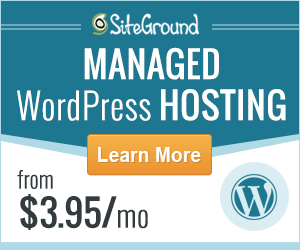 SiteGround vs Bluehost vs HostGator For WordPress – Which Is Best To Use In 2018?